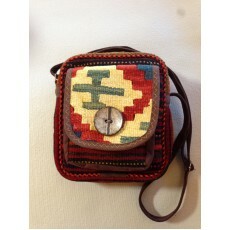 This one of a kind shoulder bag was handcrafted in Iran with naturally dyed wool in the traditional, Persian kilim style. This piece features an adjustable leather strap as well as some smaller leather accents. Also, the front and back of this bag have different designs and are made of different materials, adding to its uniqueness. Featuring a smaller pocket on the outside, this bag is both stylish and convenient. Represent your individuality with a bag as distinctive as this one.